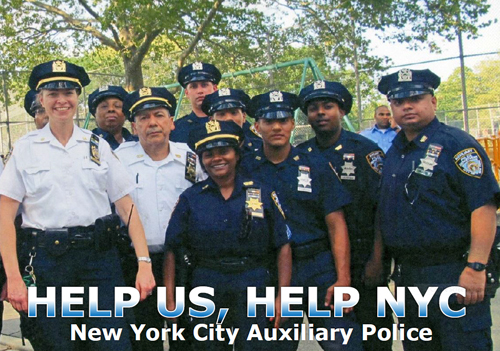 The NYPD Auxiliary Police Program is the nations largest and finest volunteer crime prevention program. Over 4,000 dedicated men and women contribute over 1 million hours of service each year to their community. The Auxiliaries function as extra EYES AND EARS for the Police Department. Their primary function is described as PATROL, OBSERVE, and REPORT. In 1950, the 81st Congress passed the Public Law #920, entitled The Civil Defense Act of 1950 authorizing a Federal Civil Defense Program. In 1951, the New York State Legislature enacted the Defense Emergency Act requiring New York City to recruit, train, and equip volunteer Auxiliary Police, who would then act as a liaison to the NYPD in the event of an emergency or natural disaster. In 1967, A Mayoral Executive Order closed the Civil Defense Headquarters and placed full responsibility of the Auxiliary Police Program with the NYPD. During the 1960s when crime was on the rise, uniform Auxiliary Police patrols were an effective means to deter crime. The Auxiliary Police have been effective in providing assistance during major events and emergencies such as the NYC Marathon, Thanksgiving Day Parade, Borough Harmony Picnics, Y2k, 9/11, emergency blackouts, etc. Most people join the volunteer Auxiliary Police Program out of a sense of community and public service, while others join the program to see whether they would be interested in a career in law enforcement. What are the qualifications you must possess before joining the Auxiliary Police Program? 3. Live or work in New York City. 4. Be in good health. 5. Be able to read and write English. visa or alien registration card. 8. Be of good character. Make a Difference. Call 212-AUX-1000 or 212-289-1000 or visit your local precinct, housing police service area, or transit district and ask for the auxiliary police coordinator. Find your precinct here. You may also fill out an application online or mail an application. See forms below. Print and mail this application. APBA (Auxiliary Police Benevolent Association) of the City of New York, INC.
103rd Precinct (718) 657-8181 168-02 P.O. Edwaard Byrne Ave. This web site is owned and maintained by The New York State Association of Auxiliary Police, inc. It may be used by any NYPD Aux. Police Unit for a linking page. We would like to thank qsl.net for the use of this web space.